How easy is it to modify this for recurring tasks (weekdays, weekly, monthly, quarterly and yearly) and maybe show a monthly view? Times are less important than just showing what is due on what day. 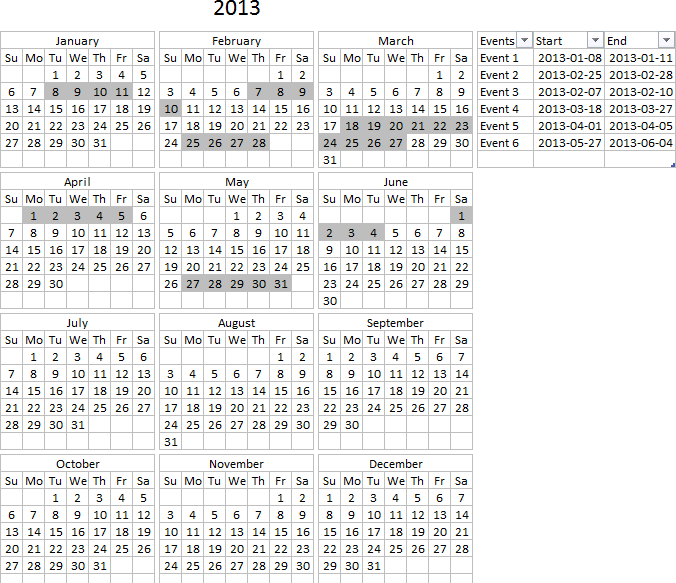 I made a calendar shown below, monthly view. The picture is resized to fit this blog, click to see the original size. This calendar is more advanced than the template I made year 2011. The form next to the calendar allows you to add events. Enter time and event name and then click button "Add". If there are more events on a single day than can be displayed, the last line tells you ...more.... See picture below for an example. Select that cell and all events are shown in a table next to the calendar. You can easily edit or delete an event by clicking a link in column Time, see picture above. The link takes you to the record on sheet "Schedule", see picture below. Here you can edit or delete the record as you please. The buttons above the calendar lets you go to next or previous month, there is also a button that takes you to the current month, button "Today"
Days before and after selected month are grayed out. 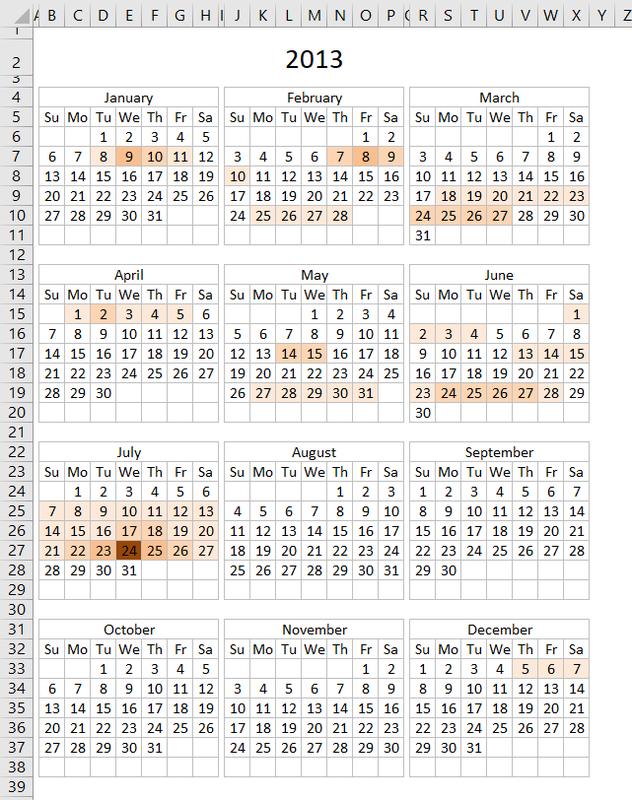 Current day is highlighted orange. The following picture shows you this. 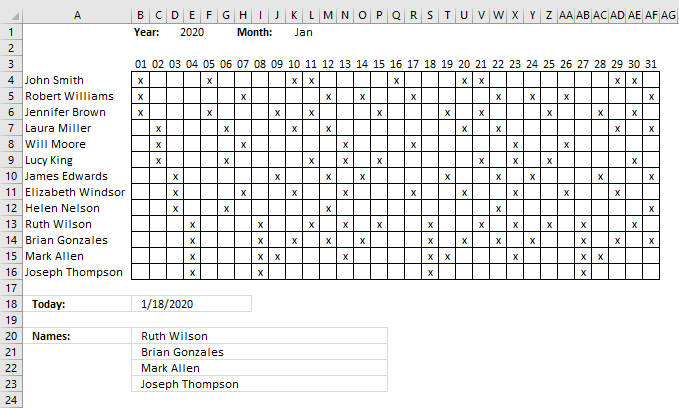 The best I could do is creating a formula that calculates the upcoming recurring event. 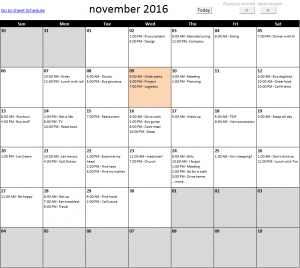 Events after that are not shown until the date has passed. This bigger version has 10 rows per day. Excellent, excellent job Mr. Oscar !!! You are right, thanks for telling me. My blog (WordPress) has changed the name of the workbook when I uploaded the file, the hyperlink function uses another workbook name and that won't work. Anyway, I have uploaded a new workbook and this time it seems to work. Change the bolded numbers above to select a day in a month. The example above uses the 3rd in every month. 11/24 is 11 AM. A day has 24 hours. Change number 3 above to select a weekday, 1 is Sunday, 2 is Monday and so on. 15/24 is 3 pm. The daily formula is self explanatory. To use a recurring event, go to sheet schedule and select a cell in column "Day and Time" on an event you want to recur. Change the value to the desired formula. Thanks. There is a new file to download. This is so helpful! I am using it as a sprint planning calendar to track different work streams! THANK YOU! I am happy you like it, there is a download link at the end of this post. Thank you so much for this great and very helpful calendar. 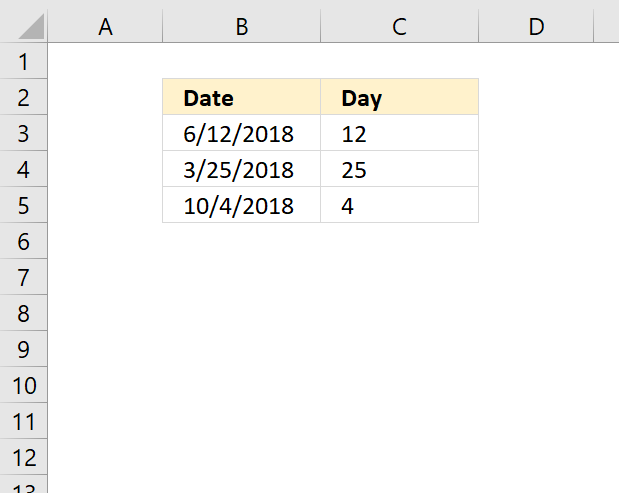 Is there a way to have a recurring event as birthday reminder using either an Excel function as in your example or obtained from a list of dates and names? (Cont'd) Also, is it able to add repeated recurring events such as paydays (every 2 weeks on Friday, Saturday work every 5 weeks...). 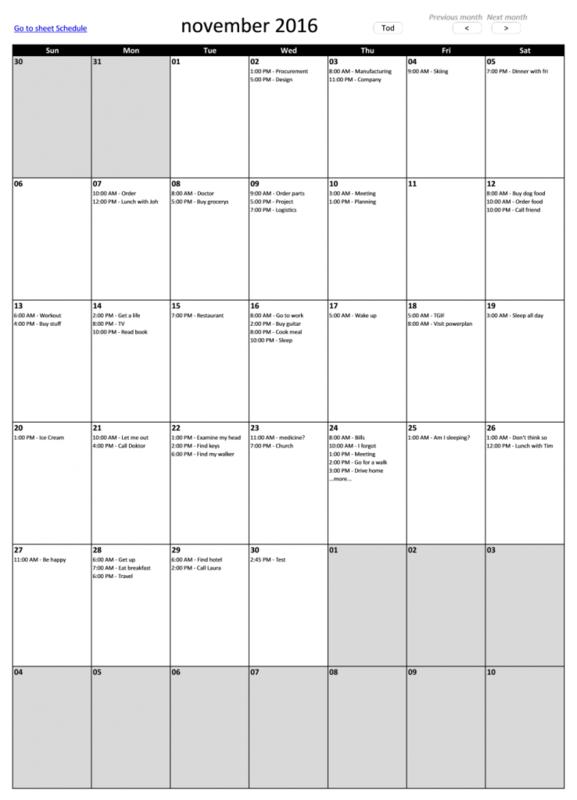 Hi Oscar, this was very helpful for me as well and have implemented these calendars in my workbook! Do you know if there is a way to show more than 5 items on a day in the calendar view, maybe 10 lines? I forgot to change the macros and event code. I believe it is working better now. Oscar, Thank you for the template! Question: some of my longer events are truncated. "Pancake Breakfast" shows up as "8:00am - Pancake Breakfas" it seems there is a character limit somewhere in the code but I can't find it. Also, I'd love to have the date, and the time in separate columns. That way for time I could leave it blank, OR I could use 'times' like "All Day" or "Afternoon". result = result & "...more..."
Perhaps this is working for you? Hi! This worksheet works perfectly! However, can I check how do I modify the formulas such that I can define a start and end date to a certain event, and it will populate for each of the dates involved? Thanks for the alternative link! I would suggest that you enter the date and time for the event multiple times in the table, however, only the date will differ. That way you will get the event one each date. Hi! Thanks for the reply! Have tried the method to key in date by date but this is rather time consuming on the user's end as some events can span across months. Is there a way to tweak the form input such that I can just key in start and end date, then this will automatically populate into the data table per individual dates? I've recently started working in an office environment and I'm having to seriously step up my Excel 2016 knowledge. Each day needs to contain 9 cells, with borders, with items I can have reoccur from Monday to Friday. Each cell relates to a task. To show the task has been successfully completed I change the cell colour from white to green. To stick with current checklist document trends, it would also be very helpful to be able to have each individual month displayed within a single page instead of a single page with a month changing menu. to 4,4 it does not change the event to a Wednesday and it does not reoccur on every Tuesday within the calendar when copied and pasted into the 'Date and Time' column of the 'Schedule' page. I have removed the time portion of the equation as I've changed the date format to only display the day as that's all need to know. I'm going to attribute this to my lack of understanding of the program. 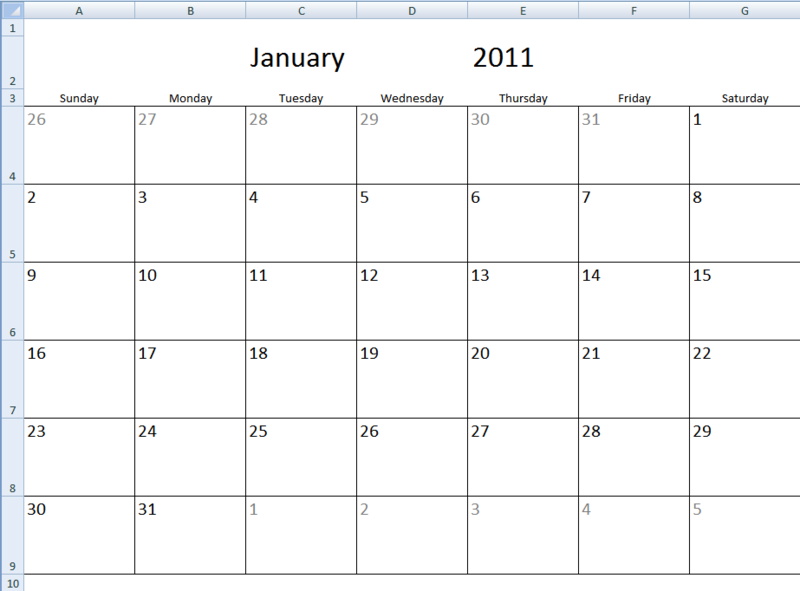 There is the potential to need to add more cells to each day as more tasks need to be added to the calendar. Are you able to tell me how to edit to add more cells? There will be no variability in the number of tasks each day. I'm so lost and I am really unsure of where to begin. Can you help? 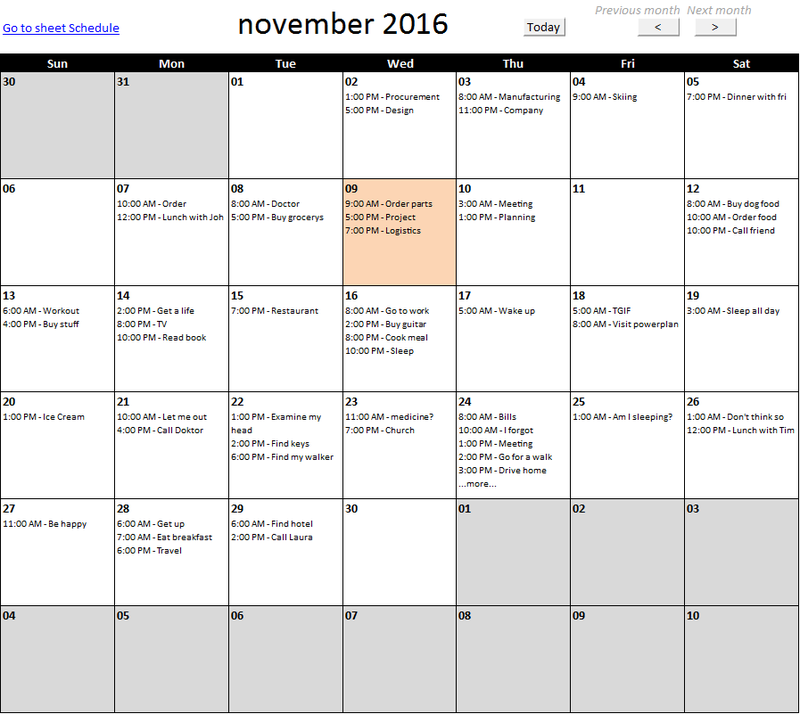 Is there a way to add additional content in the schedule that will show in the monthly view? How is the Lookup_concat function being added to every "date" on the calendar? 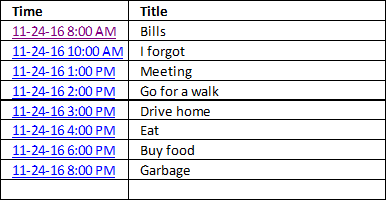 I have modified the Schedule Table slightly, and want to update the function on all the calendar days, how would that be accomplished? Why don't you download the workbook and check it out yourself? 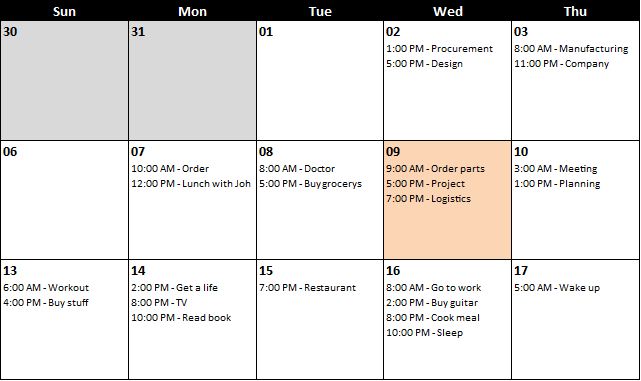 I have modified the Schedule Table slightly, and want to update the function on all the calendar days, how would that be accomplished? 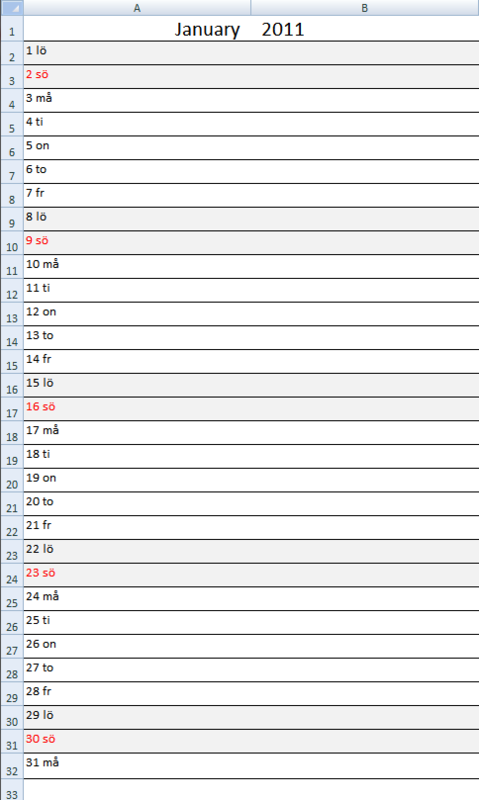 Have you inserted a new column to the Schedule table? Can you explain in greater detail? You don't need to add additional VBA code to your workbook. Yes, you need to change the links in the formulas. See the bolded part above, don't forget to enter the formula as an array formula after you changed the formula. Now copy cell J6 and paste as far as needed to cells below. This posting, along with the others related to calendars, are awesome! The discussions also answered many of my questions. I have a question regarding text colour coding for different events on the same day in the Monthly view. I tried conditional formatting and find and replace, but neither worked. The former colours all the events the same, and the latter is unable to find the text to replace. What would be the best way to approach this in Excel 2010? Thank you. Oh yes, this is also something I'm curious about. I am hoping to be able to change the color of the text by person (ie, me in red, my husband in blue, my daughter in purple, etc. This way I can see whose event is happening at a particular time on a date. Is there a way for each cell to be separate, so these colors can be conditionally formatted, instead of it being concatenated into a large merged cell? Thanks, this is a great calendar! Not at the moment, I need to rebuild the macro that populates the cells in order to make it work with conditional formatting. I'm trying to download this form. Its not working as I don't see the download link as for other forms on here. Am I doing something wrong?